I have to admit to an embarrassing situation Wednesday afternoon. 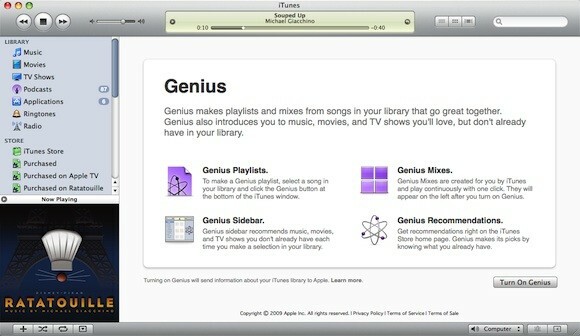 While writing the iPhone OS 3.1 overview post, I got to the section about "Genius Mixes" and was totally boggled. I couldn't see any way to create them on the iPhone itself, and there was nothing I could see in iTunes 9 that would do the job. Fortunately, there are some fairly bright people here at TUAW, and after a couple of quick exchanges in iChat, I had Genius Mixes working. If you don't have access to a Mac and iPhone brain trust like I do, you might also have problems setting up Genius Mixes, so I'm here to give you the rundown on how to do this. Read on for the rest of the details. If you haven't installed either of these updates yet, you'll need to before you'll be able to use Genius Mixes. You can download the iTunes 9 update here, and you'll need to plug your iPhone into your Mac or Windows PC with iTunes open to get the iPhone OS 3.1 update. 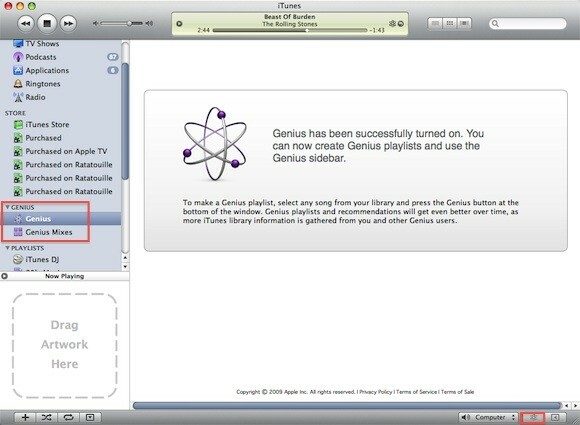 This step depends on whether or not you've used the Genius feature before. I never did; my tastes in music are such that I don't need anyone making suggestions about what I should listen to. 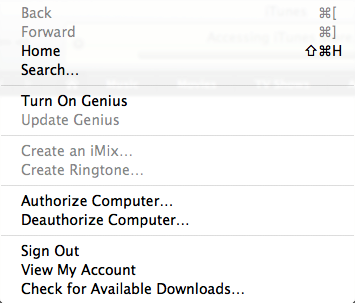 Under the Store menu in iTunes 9, select Turn On Genius (see below) to turn on the feature. If you've already used Genius in the past, just select Update Genius from the same menu. This is actually quite an important screen, since it describes how to use the different features. Genius Mixes appear on the left sidebar once you've turned on or updated Genius. 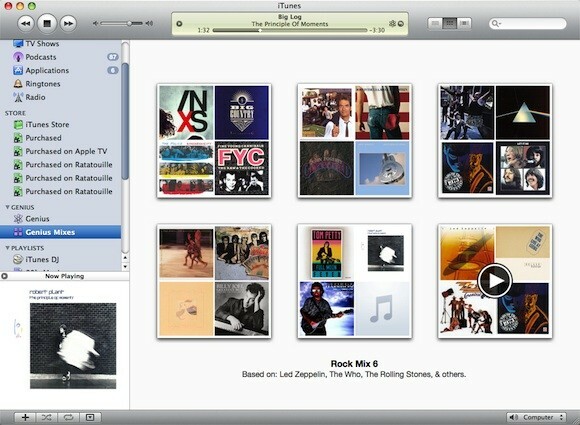 I had six Rock Mixes created, since most of the music in my iTunes library is rock. 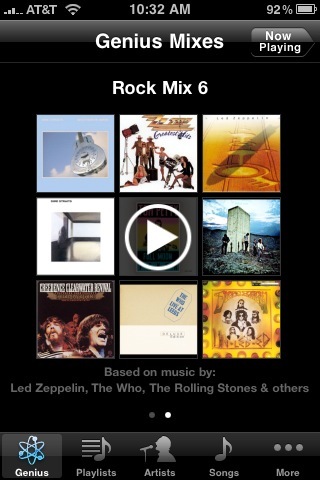 Now, how do I get these Genius Mixes to show up on my iPhone? When your iPhone shows up under Devices in the sidebar, click on it, then click on the Music tab. See the list of playlists below? There will be checkboxes for all of your Genius Mixes. 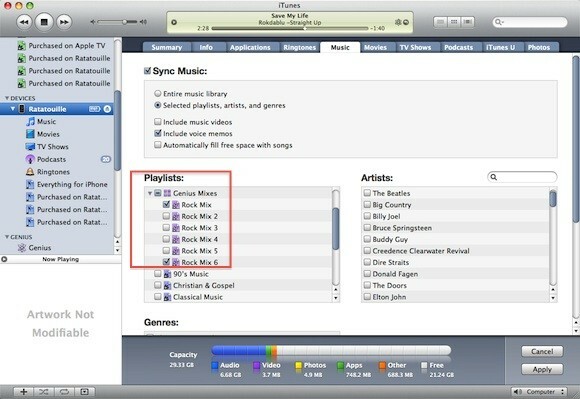 To send those Genius Mixes to the iPhone, check the appropriate boxes, and then click the Apply button to sync them to your iPhone. The next time you launch the iPod app on your iPhone, you'll notice that a Genius button appears (see screenshot below). In this case, tapping on it displays my Genius Mixes. Flicking left or right on the iPhone display switches between the Genius Mixes, and it just takes a tap on the screen to start playing the mix. By the way, when you tap on the Genius Mix to begin playing it, there is some fun animation of the album covers. I listened to several of my mixes and was pleased with how the music seemed to "go together." Genius Mixes are a fun way to have iTunes take the work out of making a mix of music for you, and as you can see, they're extremely easy to set up. If you've set up Genius Mixes, we'd love to hear how they're working out for you. Leave a comment below.